Dutch colonial army in West Java holds a tournament to select the best warrior to confront local freedom fighter Parmin (Jaka Sembung). The winner is a blind swordsman. Things get complicated when magician seductress Dewi Magi intervenes. Balung Wesi was defeated in battle and is seeking revenge on Ki Sapu Angin, the teacher of Jaka Sembung, The Warrior. In mobilizing power to fight the Dutch, The Warrior makes the acquaintance of Bajing Ireng (Black Ninja). Okay action fantasy but major step down when compared to the first film. Major let down after the first warrior film, this is an action filled, but a bit dumb movie. This movie begins with a small village attacked by the Dutch. The attackers a routed by Jaka Sembung. This causes the Dutch to try and find the best man to kill Jaka by having a tournament. Si Buta, the blind swordsman (and star of his own comic and movie series) is the winner. Promised a large reward Si Buta finds and kills Jaka, however the Dutch try to get the reward back and send a small group of men to kill the blind man and take the reward. Where it goes from there is the movie and I wouldn't want to ruin any of the surprises. As I said before this is a disappointment after the first film. The action is really cartoonish and over the top while the make up and effects are just okay (and kind of fun in a low budget way). The real problem is that the plot is wildly unwieldy. There are simply too many "main" characters; we have Jaka, Si Buta, the Dutch and Maki to contend with. Maki is an "evil" woman who sold her soul for immortality and has the hots for Si Buta. She also lords over a group of villages and how the Dutch treats her kingdom determines some of her actions in the film (and has enough material in it for a movie of its own).Its too much story being carried by too many "minor characters" (ie. the ones not in the title). 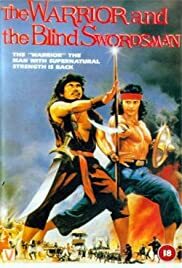 Honestly its not a bad movie as these things go, but compared to The Warrior (aka Jaka Sembung) is a major let down. (I do reserve the right to reevaluate the film after the memory of the first film- which I saw last night-fades).